Campaign organization partners, be sure to register at Become A Partner. Browse campaign resources and more. Boating enthusiasts, always wear a life jacket and boat responsibly. Safety on the water is everyone’s responsibility. Join the conversation on Facebook and Twitter. Wear Your Life Jacket to Work Day | May 17, 2019: Hosted by the National Safe Boating Council, this annual event is a fun, educational way to heighten life jacket awareness and highlight the various styles just prior to the official launch of the Safe Boating Campaign. Anyone can join in this fun event! Wear your life jacket to work, snap a picture while at work and share on social media with the hashtags #lifejacket2work and #safeboating. 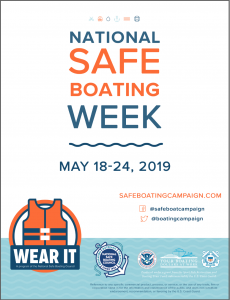 National Safe Boating Week | May 18-24, 2019: The Safe Boating Campaign kicks off the weekend before Memorial Day with National Safe Boating Week and continues throughout the year with various events and activities. Find Partners in your local community who support the Safe Boating Campaign and find out how you can get involved in outreach events. Remember, any time you’re boating, set an example for others and always wear a life jacket and boat responsibly. Join the conversation on Facebook and Twitter.